Do you often find yourself cooking and a recipe calls for butter or vegetable oil but want to stay healthy? I probably find myself in this predicament on a nightly basis. Although I am a generally healthy cook, I have Southern roots. I learned how to cook using slabs of butter and lard. These days, unless I was having a crazy cheat night cooking my Grandma's fried chicken (it happens), I always use Extra Virgin Olive Oil in recipes that call for butter or other evils. Recently, I was introduced to an even healthier option, Pompeian OliveExtra Premium Mediterranean Blend. This unique blend provides essential Omega-3 and Omega-6, monounsaturated fat, and Vitamin E Antioxidant. OlivExtra® Premium contains Vitamin E that has antioxidant capabilities that may help protect against diseases such as cancer and heart disease. 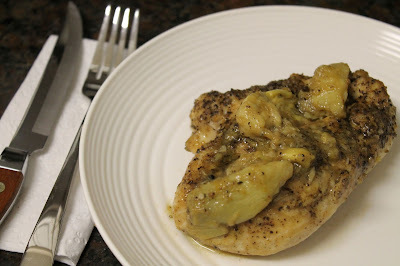 The first time I experimented with Pompeian OlivExtra Mediterranean Blend, I decided to make one of my favorite chicken recipes. It was a huge success and I am greatfeul for this healthier option. You can save $1 on Pompeian OlivExtra Premium oil by clicking here. While a cast iron skillet is not mandatory for this recipe, I absolutely suggest it. This is one item in the kitchen I tell everyone to invest in. Using a cast iron skillet for this recipe will allow your chicken gets a nice sear, keeping your chicken juicy and bring extra flavor to the garlic sauce. I LOVE my cast iron skillet! This recipe is best served with the wine you cook with, or at least that is my non-professional opinion. This night, I paired Once Upon A Vine "Lost Slipper" Sauvignon Blanc, which was a perfectly crisp wine with a hint of citrus. In true fairy tail style, it was the prince charming for my chicken little! Not to mention, the bottle and name are super cute. Directions Preheat oven to 450°. 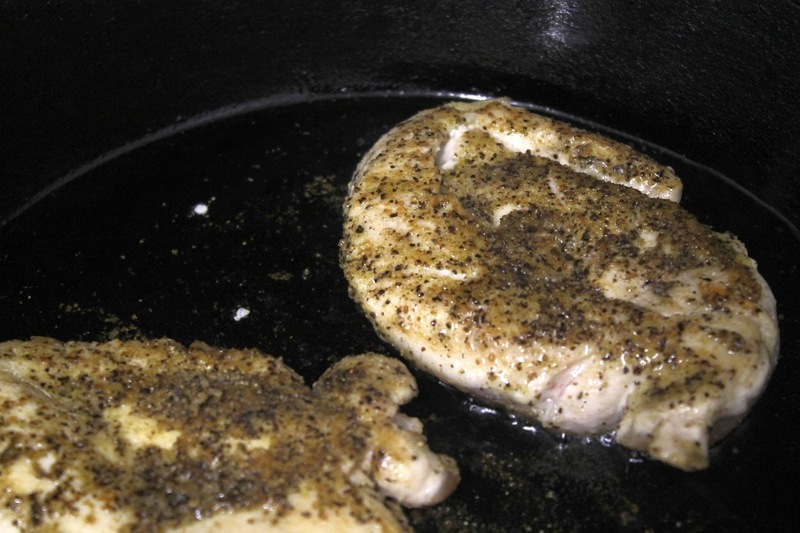 Heat Pompeian oil in a large cast iron skillet or ovenproof nonstick skillet, medium-high heat. Meanwhile, using a meat mallet, pound your chicken to 1 1/2" thick. Somehow, this is an enjoyable task on a bad day. Sprinkle your chicken with the first four (dry) ingredients. Add the chicken and cook 2 minutes on each side. Add garlic and chicken broth. Place skillet in a preheated oven and bake at 450° for 12 minutes or until chicken is done and garlic cloves are soft. Remove pan from oven and transfer chicken to a platter, covering chicken with aluminum foil to keep warm. Add wine and lemon juice to the skillet and mash garlic with a fork. Add the artichoke hearts and cook the sauce over medium heat for 2 minutes or thickened. Serve garlic sauce over chicken. Yield: 4 servings (serving size: 1 chicken breast and 2 tablespoons garlic sauce). 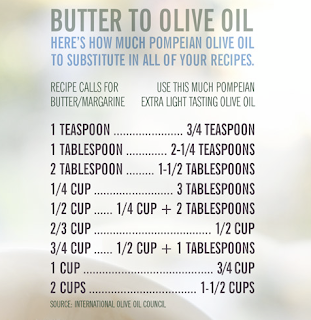 Here is a Butter to Olive Oil conversion chart just in case you were interested!